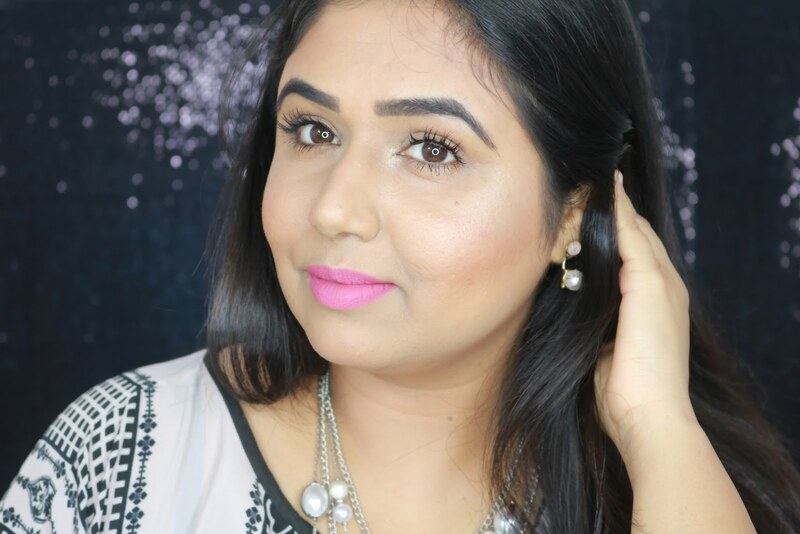 Bharat and Dorris Blush in Shade 01 Dupe of MAC Dollymix? Click to find out! There was a time when I would buy loads of makeup on an impulse! One such purchase was this blush from Bharat and Dorris in the shade 01. I got this blush last year from their Infinity Mall store in Malad, Mumbai and it retails for 450 for 5.2g. The packaging of the blush is very similar to those of MAC blushes. The blush comes in black box packaging same as MAC. The blush itself comes in round pan packaging with a transparent lid again very similar to MAC blushes. I have traveled with this blush quite a few times and never had any issues so its quite travel friendly. The round plastic packaging is nothing extra ordinary but then with the price I really can't complain now can I? One thing which bothers me is their shelf life! Who can finish off an entire blush in a year? I could if I would use only one blush throughout the year which seems really unfair to the other gorgeous blushes in my vanity :) Though its been more than a year now that I have used this one, infact I used quite a lot in last couple of months and never had any problems with it but still I wish they would increase the shelf life to atleast 3 yrs! Lets talk about the shade now. Remember I mentioned how this one was an impulse buy? The thing is during the time I bought this blush I was desperately looking for something similar to MAC Springsheen or Sleek's Rose Gold blush, so when I swatched this one in the store due to the orange store lights I found it to be similar to Springsheen and Rose Gold and hence bought it right away! Only after coming home I realized it was completely different..well this does not mean I didn't love it :) I don't regret purchasing this one bit! The shade is gorgeous bright berry shade with golden sheen to it. There are absolutely no chunky glitter or shimmers in this blush which is a huge plus for me! The blush has perfect mix of gold and berry shades and looks stunningly beautiful when paired with similar shades on eyes and lips! This is definitely not an everyday wear shade due to its golden sheen but more of a party wear! Its the most perfect blush for to-be brides or weddings and special occasions. Did I mention is the exact dupe for MAC Dollymix Blush? Now I don't own MAC Dollymix but looking at the swatches online both look very very similar! The texture of this blush is extremely soft in fact this is probably one of the softest blushes in my collection when it comes to the texture! Since its extremely soft there can be a little fallout on the sides of the pan but nothing too major.The pigmentation is incredible so one has to be careful to lightly dip the brush in to the pan. It blends extremely well, even if you applied too much product you can easily use a compact to tone down the blush and blend it to get the perfect look! -> Blends like a dream! -> Exact dupe for MAC Dollymix blush! -> Availability of B&D products is definitely a problem! Currently they are only available in Mumbai pls correct me if I am wrong and mention below if you know any other cities where B&D products are available. -> Shelf life of 1 yr which is a real bummer! I love this shade and would definitely recommend it to everyone especially if you are a to-be bride or an aspiring makeup artist, this shade is a must have for you! This blush is definitely not for faint hearted and it does look quite scary in the pan but don't go by the looks since it gives the most gorgeous rosy pink glow to your cheeks! I hope the review was helpful to you all, until next time take care and stay beautiful! Really reminds me so much of Dollymix :) Very pretty ! Its a very pretty shade Sharmistha! The color is just amaiznggg. supr likkee..